Pretty Little Pocket: Planners and Notebooks, Oh my! Planners and Notebooks, Oh my! 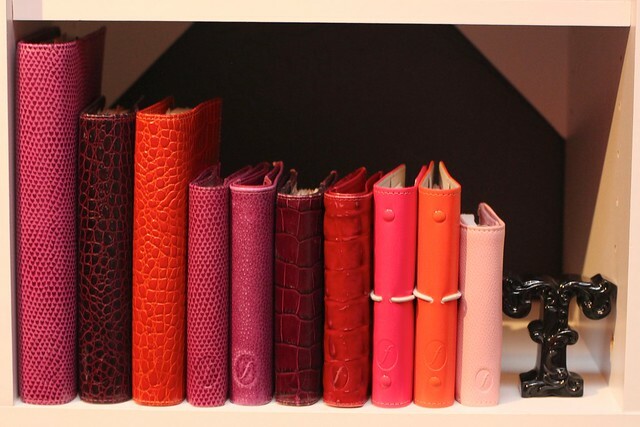 Today I'm going to introduce you to my Filofax family and my other planner collections. As you can see I keep them all lined up on the shelves in my office closet. My shelves just make me happy every time I see them! On the Left side I keep my Franklin Covey / Quo Vadis / Moleskine and other random planners and notebooks. I just ordered a new Classic size Franklin Covey that will serve as my work planner (as an experiment - more on that in another post). The zebra striped trunk in the middle of the shelves holds a massive amount of journals and diaries that I've filled up over the years. A5 Chameleon in Raspberry - A travel Filofax where I keep information on upcoming trips, trips I am dreaming about taking, camping trips, and day trips. Personal Osterley in Plum - My everyday Filofax. I've recently posted about my setup on my other blog. Personal Osterley in Orange - This is a recent purchase and I haven't set it up yet. I am thinking of using it as a health & fitness binder. Pocket Chameleon Raspberry - Another recent purchase. This will be my wallet, once I get it set up. Pocket Finsbury in Raspberry - Not currently in use. Currently for sale. Pocket Osterley in Plum - Not currently in use. This one was my main planner until I switched to the personal size. I'm not sure if I'm going to sell this one or not, because I love it so much. Pocket Amazona in Red - Not currently in use. This one is going up for sell soon. Mini Miami in Pink - Not currently in use. Currently for sale. So that's a current snapshot of all the binders I own. It is always in flux! I'm thinking about buying a few more binders, but I need to sell my pockets first.